To continue the fun I thought I would explain some of my logic for an outward opening external door. First off, I found a great discussion thread on the topic here. The best comment was clearly "Creates a clear threshold that magical creatures cannot cross without being invited". The other one was how it was easier for emergency services to break down the door (and for police, HMRC, etc, too) if it is inward opening. It seems to be the case that in the UK, and apparently the US, external doors normally open inwards. Some other countries (Sweden was mentioned) do not follow this rule. I used to have a house that opened right on to the street, and for that an outward opening door (especially with no window) would have been, err, fun. But here I am opening on to our drive. 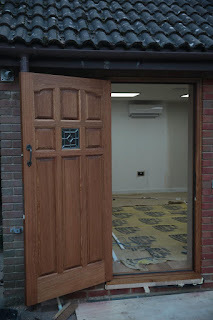 My reasoning is simple, and applies to both internal and external doors - I want to maximise the space I have been graciously given by my wife for my "man cave", and outward opening doors help with that. The internal door uses the same space as a cupboard in the utility room, so a no brainer - not taking away any extra space doing that. The external door is more interesting. One is quite important - the hinges are exposed and someone could break them, cut them off, pop the pins out, or some such. Obviously this would trip the alarm, but a smash and grab could get stuff. The answer is, however, very simple - hinge bolts. They stop the hinge side being forced like that. 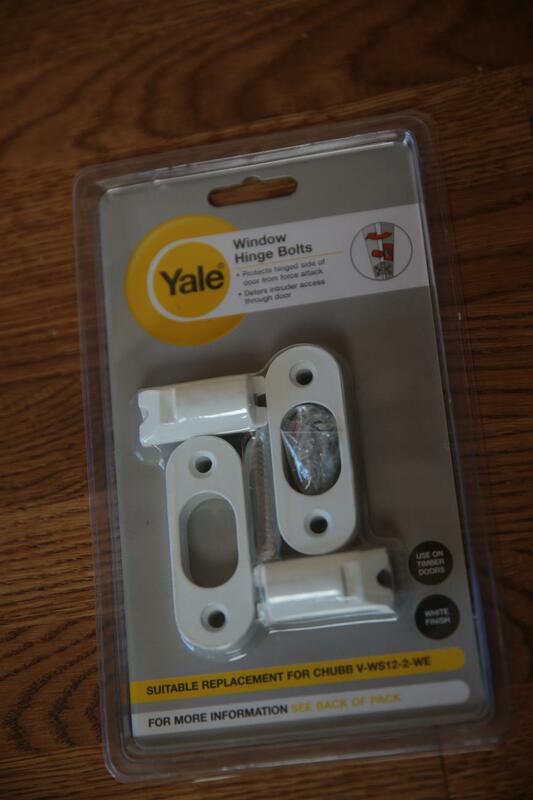 Only issue is why they are labelled "Window Hinge Bolts"??? The only other real concern (and magical creatures are not an issue, AFAIK), is catching in the wind. I am not sure I need to worry - it will simply be a matter of being careful, but I plan to try installing a concealed door closer in the top of the door limiting it to 110° and closing the door nicely. I may try this on internal door first to see how well it works. Sandra has a concern if she was to park too close on the drive, but to be honest, I do not see the size of a door being an issue, even if a 3ft wide one. A sensor on the door, at bumper level, which flashes a light at visible-in-a-rear-view-mirror level mounted on the outside of the garage? I doubt it will be an issue, but I was thinking maybe something ultra sonic to disrupt the parking sensors. They are metal and heavy with a white coating. Never mind Sandra's parking; what if there's a really heavy snow fall, maybe drifting against the house? You'd be stuck in your cave until spring; just like the neanderthals! As long as there's water, coffee, food, a programmer's workstation and other essentials of life in there, does being stuck actually matter? I don't think it will make a difference whether your door was outwards or inwards opening re: police or emergency services gaining access. Your door would be as easily operable with with standard police equipment (Enforcer and Halligan Bar) with 'standard training' as it would if it was inwards opening. You could attack it with the Halligan bar to open it outwards or use the Enforcer to knock a panel out or indeed the entire frame. It looks like you only have a single lock which is quite low down in the door, the problem with this is you will be able to get a crowbar in the top and move it down the door. It might be worth having a bolt at the top and bottom on the inside to secure it when you go on holiday. 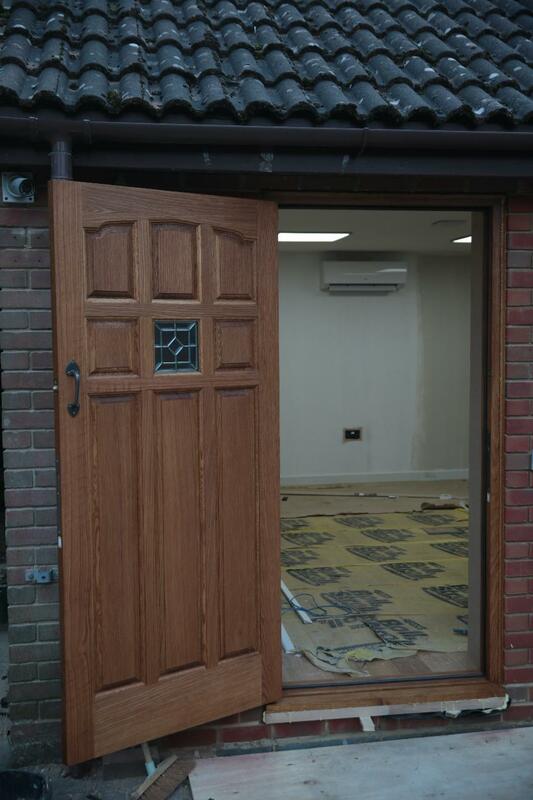 The most effective doors against standard method of entry equipment are multipoint locking, composite construction, inwards opening doors as they simply absorb the force. The way round that is a two-man enforcer or Stihl Rescue saw ;). One question might be would any kind of button/emergency release inside be operable by someone smashing the small window and putting a rod or similar through? Sometimes it's quicker to put a window through in fact! It is but glass poses it's own hazards and has to be approached by those with more skills and equipment. You definitely need a big Hooligan bar but you also need helmet, eye protection, Kevlar blanket, Kevlar gloves, ladders etc. For police, entry through glass is only undertaken by specialist officers. Looking at Rev's windows, I still suspect any government entities who might want in would go through the door using 'the big red key' :). A burglar would probably gain entry through a back window or door and then smash the internal door down! The internal door is a pretty slide fire door with the same locks but probably not quite as sturdy. Surely the main reason for opening inwards is to stop the door getting a soaking every time you open it during an English summer. I believe it's the norm - required, even - for exit doors in commercial buildings to open outwards. This is because in an emergency, a pile up of panicked people could prevent you from opening a door inwards to escape, while an outwards opening door will always work. I was expecting a whole blog article on the choice of electronic locks! But would be interested in the access control system, as I know you'll have made a good choice!